Left to right: Kayla Stride, Natasha Blackwood, Jaime O'Leary, Stacey Howse, Danielle Benoit, Jenelle Duval, Rebecca Sharr. Eastern Owl is known locally and nationally as a unique group of women who blend the styles of First Nations Drum Music and Contemporary Folk to create their own innovative sound. A powerful ensemble of seven vocalists, they have been captivating audiences at festivals and concerts across Canada. With deep roots in community, Eastern Owl has committed to deepening their connection with their traditional practices while helping to educate indigenous and non-indigenous audiences alike. 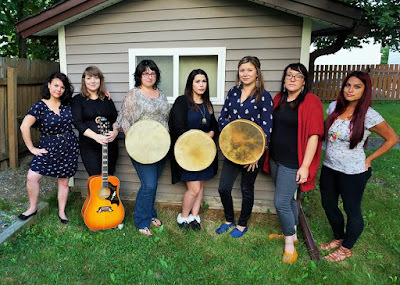 They are recent recipients of the 2016 ArtsNL CBC Emerging Artist award and have taken the national stage during Canadian Music Week, Coastal First Nations Dance Festival, and Petapan. The women have been making waves following the release of their celebrated debut album “Not Quite Like You” and are currently one of the most in-demand groups in Newfoundland and Labrador. At the forum, Easten Owl will conduct the opening ceremony where they will undergo land acknowledgement and perform a couple of their songs.